If you are celebrating a special occasion in Barrie and the surrounding areas, one way of enjoying a night out with family and friends is reserving a limousine for a special event to bring everyone together and truly enjoy a night out. With many limo companies that provide limousine services in and around Barrie, the one that specializes in offering you with a luxurious party bus limo in Barrie is Platinum Party Bus Limos, offering a variety of different limo fleet of buses that you can choose from. 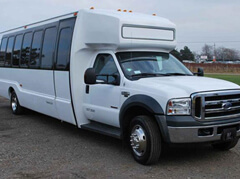 We offer party bus limos that can seat upwards from 18 passengers to 26 passengers, and then we offer larger more luxurious limousine buses that can seat from 30 passengers up to 50 passengers for that truly unique limo bus experience. From such occasions to weddings, proms, night out limo rentals, including bachelor party limos and sporting event limousine services, to a casino limo ride from Barrie to Casino Rama in Orillia for example, let Platinum Party Bus Limos be your party bus limousine experience of choice. We have booking agents that are standing by that will be more than happy to answer any questions that you may have regarding your party bus limo reservation. Call today to book your party bus limo from Platinum Party Bus Limos.